Hero777 was established in 2016 and is now a project of the ENZA Trust. ENZA is a Non Profit organisation and Public Benefit organisation ( 127-404 NPO ). ENZA is a section 18A approved organisation. To donate please click here. Hero777 aims to increase awareness about organ and tissue donation in South Africa. Our aim is to use all avenues open to us to raise awareness. These include but are not limited to social media, print media, radio or television, events and campaigns. A number of years ago, a then 13 year old Durban boy, Matthew Legemaate, was placed on oxygen permanently and listed for a heart and bi-lateral lung transplant. Matthew had been born with a congenital heart defect, Tetralogy of Fallots and severe pulmonary atresis and had his first of many open heart surgeries at 36 hours of age. Over time we have told his story in the hope that this would encourage people to register as organ and tissue donors. 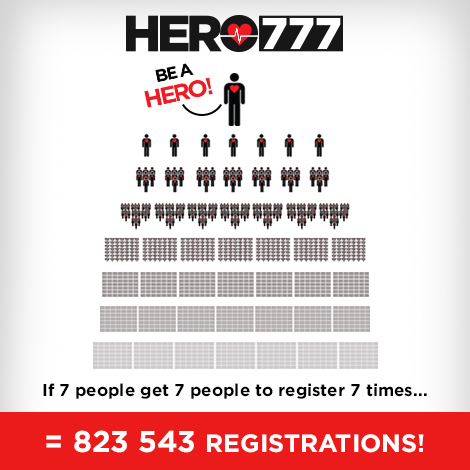 At one point Matthew became determined to encourage people to register and we came up with the #Hero777 campaign.